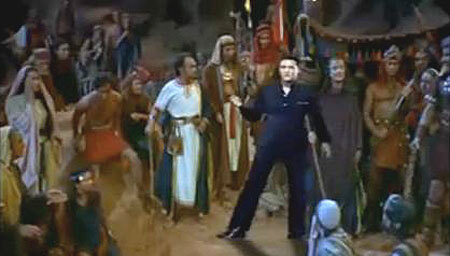 In Soda_Jerk’s 2009 video Tap Hop, there is an unlikely dance-off played out in an uncanny shot/counter-shot sequence. 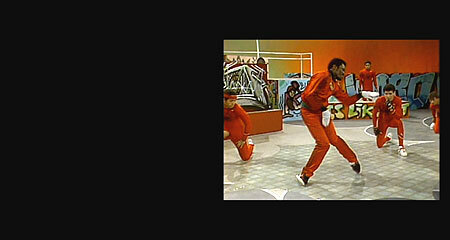 This split screen work syncs the dancing group Tip, Tap and Toe from Pardon My Sarong (1942) with the hip-hop moves of the New York City Breakers on the television show Graffiti Rock (1984). If the substitution of one form of visual funk with another alone constituted this work, it would be interesting – but nothing more, merely underlining the well-known cultural anthropology that any given style is a mutation of a predecessor. But it is the re-voicing of each video with the sound of the other that makes this work truly remarkable. In the artists’ words, this sonic haunting ‘examines the formal and cultural connections between tap and breakdance’. The didactic tone here is important; Tap Hop, like much of Soda_Jerk’s work, is a ‘lesson’ in how remix is not slavishly ripping off a pre-existing text. But it also creates a new text to be added to the historical archive of moving image-sound works. This notion of endless variation within a large but finite set has gone by many names in the history of ideas: evolution and fractal geometry, complexity, chaos theory. The genre of remix, in a general or epochal sense of the next big thing (such as the Gothic novel, CGI cinema or reality TV), is another name for this voracious permutation that underlies cultural production. 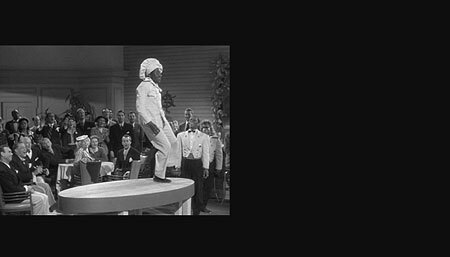 Tap Hop shows that it was not Michael Jackson who invented the moonwalk at the Motown Twenty-Fifth anniversary awards in 1983. It was Ray Winfield, the ‘Toe’ of the famous vaudeville trio. But such is the changeability of common knowledge in the age of social media that it won’t be long before Winfield, too, will be outed as a copyist and his predecessor identified. My title, then, is no sophistry. A direct quote from the artists stolen for fair use, it signifies the technical capacity of DVDs to be endlessly reproduced, creating legions of the same title like so many Martians coming off the assembly line in Tim Burton’s Mars Attacks! (1996). But, in its own way, it is also another lesson: the notion that all cultural production begins not with originality, but with copying. For Dan and Dom Angeloro, the artists also known as Soda_Jerk, there is no beating around the bush. ‘Hack the planet’ is a favourite phase of theirs. Let’s face it, appropriation, the anxiety of influence, artistic borrowing, reflexivity and the law of genre go back a long way: the Latin poet Virgil accompanies Dante into Purgatory and Hell in two books of The Divine Comedy, a work that was itself influenced by Virgil’s Aeneid, which was itself created in the shadow of Homer’s Iliad and The Odyssey and other works by Greek and Roman authors. Shakespeare – and nobody knows how – borrowed the classic five-act play structure from Seneca, who plundered other Roman and Greek dramatists to craft the ‘Senecan’ tragedy. Scratching the surface of the history of creative borrowing, of re-shaping and re-modelling, suggests that it is no surprise to know that all of Soda_Jerk’s work is underwritten by what they call the ‘zero originality clause’. Their aesthetic principle is to use entirely found media samples in which they have had absolutely no hand in the making. Unapologetic appropriation as cultural production, rather than thematic or stylistic enhancement, is contrary to the ideological ego of possessive capitalism associated with what the writer Timothy Reiss calls the ‘discourse of modernism’. Many years ago, Thomas Stearns Eliot attempted to salvage the sanctity of a poet’s heightened thought and feeling as the basis of creation when he wrote of John Donne’s capacity to feel his thought ‘as immediately as the odour of a rose’. For Eliot, the 17th century poets were truly original not in the formation of their verbal conceits, but for their unprecedented capability (apparently) to think and feel in ways that you and I can only dream of. Intention, inspiration and sensibility were at the heart of their creative act. Not appropriation. So Donne, like Andrew Marvell and other metaphysical poets, was a producer, an original. And of course the poet-genius was always male. In Soda_Jerk’s work, production has never been so solitary. And, unlike the Metaphysicals, they did not feel the need to look into their digestive systems as well as their minds. They share with the photographer Cindy Sherman and the writer-filmmaker Mark Amerika the notion that the executive work of being an artist now involves a dramatic, ideological succession from production to post-production. The term post-production has a double inflection that refers, in the first instance, to after-effects, such as compositing, colour-grading and sound-mixing. But of more dramatic relevance here, it also refers to a more substantive, Thomas Kuhn-like paradigm shift that has a name – such as the Copernican Revolution or the Renaissance. Remix is the name we can give to this shift, a term akin to new historicism or postmodernism: cultural paradigms that articulate what comes after the philosophy of originality, presence, will and individualism. For instance, to make a distinctly modern work, compose the ideas of Arthur C. Clarke, Alan Turing, Carl Sagan and Eero Saarinen with the swinging fashion of the time into a screenplay – and you’ve got Stanley Kubrick’s 2001: A Space Odyssey (1968). 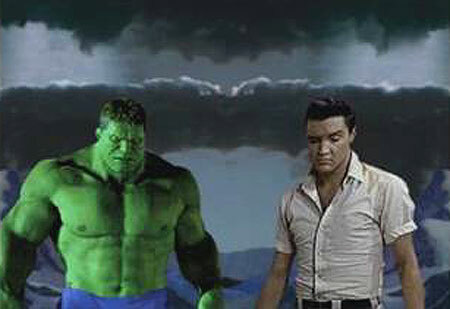 But for a postmodern work, remix 2001, Night Rider, Karate Kid, The A-Team, The Ten Commandments, Elvis’ 1968 Comeback Special, The Incredible Hulk, a bunch of anime, Elvis movies, and a lot more besides, and you’ve got Soda_Jerk’s Hollywood Burn (2011). But this thought-experiment reveals that the singular vision of an auteur like Kubrick filters through its lens various sources not of his making. He is not unlike Eliot’s genius poet, who forms new wholes while falling in love, reading Spinoza, typing and smelling cabbage cooking in a distant room – or, in Kubrick’s case, smoking. We do not have a singular, oracular representation of the West in Edwin Porter’s The Great Train Robbery (1903). There is John Ford’s Stagecoach (1939), Sam Peckinpah’s The Wild Bunch (1969), Chuck Jones’ Drip-Along Daffy (1951), Clint Eastwood’s Unforgiven (1992) or Akira Kurosawa’s Seven Samurai (1954). These directors of ‘the Western’, including Porter, were skilful adepts of Soda_Jerk’s cut-sample-copy as much as Mark Amerika’s surf-sample-manipulate. And with Gertrude Stein in mind, as well as Umberto Eco after her, a rose is a rose is a rose, right? In this, Soda_Jerk share Eco’s sense of irony as the recognition of the already said – rather than Donne’s never-been-thought-or-felt-so-deeply sensitivity. For them, there is no anxiety of influence, but rather the giddy exhilaration of superfluity, of so much stuff to work with. Since we became postmodern, no one (as we know from Eco) can say the words ‘I love you madly’ for the first time. However to say ‘As Barbara Cartland would put it, I love you madly’ quotes a sentiment and a statement that precedes your feeling and your utterance of it. So the work of post-production begins. For Soda_Jerk, the principles of post-production are two-fold. First, the contemporary world of DIY video and sound is flooded with found samples that can be re-used for another purpose, including, inter alia, more than one hundred years of moving image and sound history, countless genres, pop music and its various mutations from blues, punk and death metal to chip music. Second, and more dramatically, this same bounty reveals that any act of invention is always already a remix. Remix, in this more semiotic inflection relating to the notion of code, is (after Noam Chomsky) the morphology of representation. In Soda_Jerk’s early work, there is a literal foregrounding and use of the sample as a free-floating signifier that is profoundly atemporal, promiscuous and always in excess of singular use: we are left with the suspicion that it may precede this usage. The Fair Use and Creative Commons movements’ adoption of this principle is reflected in Hollywood Burn, a feature-length piece of the carnivalesque that, in the words of the artists, is an ‘anti-copyright epic … [a] manifesto against the corporate control of cultural history’. The aesthetic principle at work here is the uncanny anachronism of culture and cultural reception, of when and by whom something is experienced for the first time – which is, generally, out of time. As well, this anti-copyright polemic revels in the constantly changing nature of the past as well as the present, under the voraciousness of the fractured and polymorphous nature of cultural familiarity. In Hollywood Burn, original intention and intellectual ownership are fragile notions. Endless remixability is the fire in the not-so-sensitive belly of culture’s ongoingness, from the time of Moses to teen movies to action cinema and video games. Did I forget to mention Elvis? 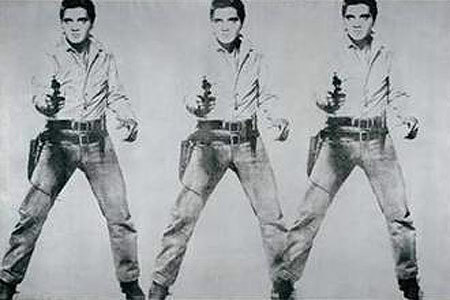 Cloned video identities of Elvis’ many film personae are sent back in time as anti-copyright warriors championing fair use, piracy and anti-copyright activism. Hollywood Burn is hysterically didactic, highlighting the seams and sutures in digital compositing and cut and paste, the amplification of obvious sound samples taken hostage from one context and supplanted into another. It celebrates the degree-zero originality of utterance and revels in quoting quotations of quotations of quotations (and so on). Here is Vladimir Propp’s Morphology of the Folk Tale, Structuralism 101 and Joseph Campbell’s ‘hero’s quest’ for beginners in action. 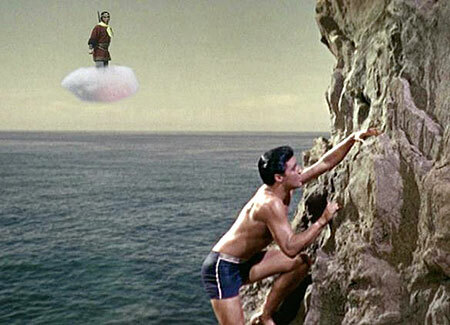 Villain: Monkey; Hero: Elvis as Mike Windgren from Fun in Acapulco (Richard Thorpe, 1963). 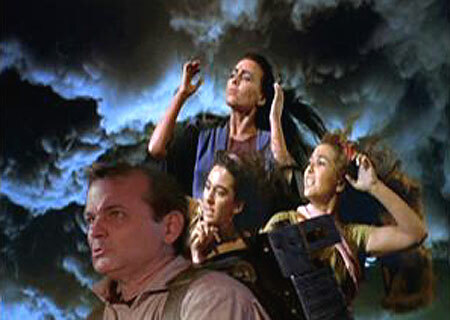 Villain: The wrath of God from The Ten Commandments: Hero: Dr Peter Venkman (Bill Murray) from Ghostbusters (Ivan Reitman, 1984). This binary variability can be applied to micro-sound grabs from obscure 1960s sci-fi cartoons, to Masters of Ceremonies at ‘50s Elvis concerts, and pre-recorded corporate warnings about copyright infringement on commercial video tapes. The endless capacity to quote someone else in another voice, from somewhere else, from another time, has been historically represented and sanctioned by what James Joyce called ‘perverted commas’. Joyce should know about quotation as a creative act. In the ‘Nausicaa’ episode of Ulysses, he has Leopold Bloom thinking to himself, ‘For this relief much thanks’, having just masturbated while watching Gerty McDowell at a distance, disporting herself on the strand at Dublin Bay. Ulysses exegetes eventually tracked the allusion down to Hamlet, Act 1, scene 1, line 10. Joyce does not refer explicitly to Shakespeare or to Hamlet, but he plants yet another detail of the Hamlet leitmotif of the father/son relationship that is woven throughout the text – along with the same theme in The Odyssey and the same theme in the lives of Stephen Dedalus and Leopold Bloom, etc. And don’t get me started on allusion and intertextuality in Finnegans Wake. Before we move on avoid the mistake of thinking that, after this fifty-two minute tapestry of quotations with their names on it, Soda_Jerk are closet self-possessive individuals of Enlightenment capitalism, anxious to protect their intellectual property. Remember their dictum scribbled in texta on the myriad copies of copies of their titles floating around wherever and whenever: Clone this DVD! In one of the most celebrated instances of unashamed body snatching in the twentieth century, George Clinton lured trumpeter Fred Wesley, bassist Bootsy Collins and several other musicians away from James Brown’s band in the early 1970s to join Funkadelic. Not satisfied with appropriating people, Clinton – former crooner of the late fifties doo-wop group The Parliaments – also appropriated the rhythm of funk, also known as Brown’s first law. 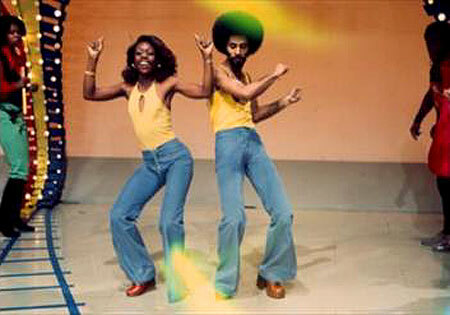 The emphasis in funk on the first beat of the bar, the downbeat, not only souped up rhythm and blues to give it its funky sound, but also endowed that beat with its own epochal name: the One. In case you are wondering, this journey into the history of black music is no musicological conceit. The connection between theft, borrowing or appropriating and the singularity of the One is an algorithm for sampling in any art form. This was the unwritten code that fuelled the experimentation of soul music, as it chased the dragon’s tail, digesting rhythm and blues, soul, hip-hop, rap, turntablism, dub – and beyond. The One in this instance is not a unicum that is without precedent, but that which is borrowed, hijacked, re-coded. When Brown’s sax player, Alfred ‘Pee Wee’ Ellis, arranged ‘Cold Sweat’ in 1967, he rhythmically funked Miles Davis’ 1959 ‘So What’ to sculpt a new song out of a pre-existing one. Here is the thought experiment you need to chew over: if you happen to hear Davis’ song for the first time, years after a solid diet of James Brown on iTunes, you will be stunned to realise how much it sounds like ‘Cold Sweat’. That anachronism of procession and precession in time and consumption is ‘the One’. 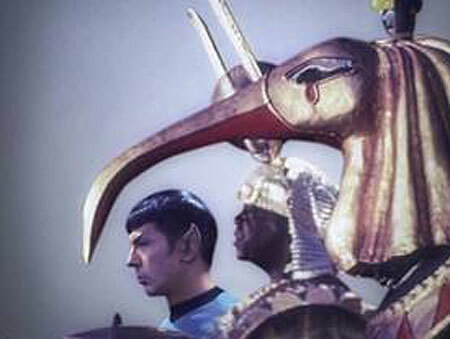 Soda_Jerk’s ongoing Astro Black series, begun in 2007, is a micro-history of the One as it has been explored and exploited through black music and culture grounded in funk – from the speculative AfroFuturism of Sun Ra, the Universal Zulu politics of Afrika Bambaataa, the turntablism of DJ Kool Herc and the mayhem of George Clinton and P-Funk. Sun Ra’s film Space is the Place (John Coney, 1974) subverts this history of otherness and its opposition to a dominant norm. 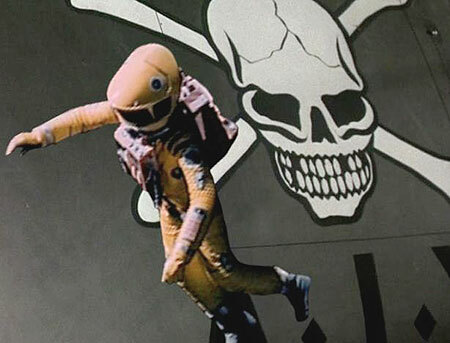 In a recent addition to the Astro Black series, Race for Space (2010), there is a curious moment of discovery. 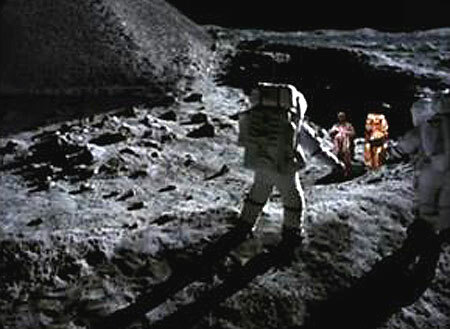 The Apollo 11 astronauts land on the moon, supposedly terra nullius, to find that it is already populated in this instance by afronauts: a colonial, antipodal moment that sounds familiar to us here in Australia (perhaps this quotation of colonialism is what the American space program was about, after all). But it also sounds very much like any moment of conception when an artist rummages around in their mind to find that glint of inspiration, that unique trace of sensibility or truth that will kickstart their originary act of creation, that no one has thought of before. This moment in Astro Black is, after the unlikely example of T. S. Eliot, the individual talent’s collision with tradition – the sensation of what it might be like, at that moment, to realise that your original epiphany is an unwitting appropriation of something not of your making that precedes you, something that you have heard before but have forgotten, sublimated or ignored. This is Harold Bloom’s anxiety of influence, a trauma of precession that you will have to exorcise if you want to become a strong and original poet. Dig … someone pinched the One before you did. But there is another response, a response that ‘stanks’, as black musicians once would have said. The response might be that to remix that found idea is kind of cool, and may lead to something that swings – while still being a riff blown by other cats before you. And that’s OK. Another name for that weird sensation of cool, of pleasing equanimity, is funk. And if you’ve got funk, you’ve got style. © Darren Tofts and LOLA September 2013.